Soon, your checkout experience will be even smoother and faster with RFID and self-service checkout kiosks. Over the past few months, we have tagged each of the almost 478,000 physical items in our collection with radio-frequency identification (RFID) chips so that you’ll be able to check out even quicker and easier. Using new self-service checkout kiosks that read the RFID chips, you will be able to check out a stack of items at once! You will also be able to renew items, place holds, and pay fines. This means less time waiting in line for you. Using RFID technology, we will also be able to get items back on the shelves faster, so that you can find them when you want them. RFID is going to make your Bucks County Free Library experience much simpler! 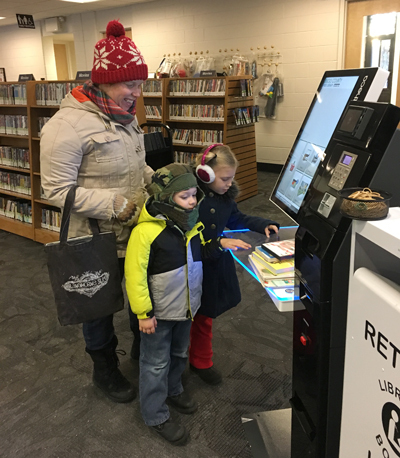 The self checkout kiosks are already in place in our Langhorne branch and will be installed at all branches by the end of January. Previous Post: Keep Your Checked Out Materials Longer! Next Post: Sensory Storytimes Now At Five Branches!